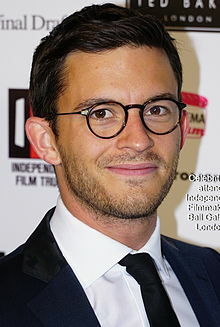 Jonathan Bailey (born 25 April 1988) is a British actor, best known for the ITV drama Broadchurch, the BBC's Doctor Who, W1A and Leonardo, and Channel 4 comedy Campus. He won the Laurence Olivier Award for Best Actor in a Supporting Role in a Musical for his portrayal of Jamie in the 2018 West End revival of Company. In 2011, he was cast as Leonardo da Vinci in the BBC series Leonardo and went on to play opposite Sarah Alexander in the BBC comedy Me and Mrs. Jones. Bailey has played the role of Tim Price in the musical American Psycho alongside Matt Smith at London's Almeida Theatre in 2013. In September 2014, he played the character Psi in the Doctor Who series 8 episode "Time Heist". Bailey portrayed reporter Olly Stevens in the ITV series Broadchurch. He also had a recurring role as Jack Patterson in BBC Two comedy W1A appearing in all three series of the show. He's also had one of the lead roles in Crashing and had a guest role in Chewing Gum. In 2017, Bailey appeared alongside Ian McKellen, Sinéad Cusack and Dervla Kirwan in King Lear at the Chichester Festival Theatre. In 2018, Bailey was cast in the second West End revival of Company, playing Jamie (originally written as a female character, Amy). For his portrayal, Bailey won the 2019 Olivier Award for Best Actor in a Supporting Role in a Musical. ^ a b "20 Questions with ... South Downs' Jonathan Bailey". What's One Stage. 19 April 2012. Retrieved 2 October 2012. ^ a b Olivier Awards (7 April 2019). "The Olivier Award for Best Actor in a Supporting Role in a Musical goes to… @JonnyBailey for @companywestend! #OlivierAwards⁠ ⁠". Twitter. ^ "Me and Mrs Jones: A new romantic comedy for BBC One". BBC. 27 September 2012. Retrieved 2 October 2012. ^ "London Evening Standard Theatre Awards 2012 — Longlist revealed". Evening Standard. 29 October 2012. Retrieved 5 March 2013. ^ "American Psycho Cast". almeida.co.uk. Almeida Theatre. Retrieved 7 October 2013. ^ "Doctor Who's Matt Smith set to regenerate … as American Psycho". theguardian.com. The Guardian. 7 October 2013. Retrieved 7 October 2013. ^ DWTV (24 February 2014). "Series 8: Meet Danny Pink - Doctor Who TV". ^ Earnshaw, Jessica (6 January 2015). "Broadchurch star Jonathan Bailey 'runs away' when pestered for series two plot details". Daily Express. ^ Mark Shenton (30 September 2017). "King Lear starring Ian McKellen review at the Minerva Theatre, Chichester – 'intensely moving'". The Stage. ^ Johnson, Robin (12 July 2018). "Jonathan Bailey & Alex Gaumond join Company revival". Official London Theatre. Retrieved 7 April 2019.